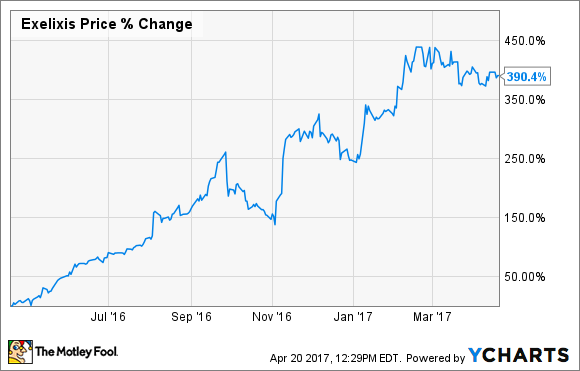 Here's Why the Best Is Yet to Come for Exelixis, Inc. There's more upside left in this biotech. Exelixis (NASDAQ:EXEL) has been on a tear over the last year, nearly quadrupling. While much of the growth in Exelixis' stock price has to do with the better-than-expected launch of Cabometyx in kidney cancer, the biotech still has room to run. Beyond the second-line indication that Cabometyx is currently approved for, Exelixis is looking to gain approval from the Food and Drug Administration (FDA) to market the drug for newly diagnosed patients with advanced kidney cancer. Arguably some of those potential sales are already priced into the current valuation, but an FDA approval isn't guaranteed -- the biotech is seeking marketing approval based on a phase 2 trial -- so there should be a bump in the valuation if Cabometyx gains FDA approval for the first-line indication. Exelixis is also testing Cabometyx as a treatment for liver cancer. The next interim look at the data from the phase 3 trial, dubbed CELESTIAL, is expected this year. If the drug isn't statistically better than placebo, Exelixis will get one more chance to prove the drug helps patients when the trial reads out its complete data at a later, undisclosed, point. Beyond those near-term opportunities, Exelixis is testing Cabometyx in combination with other drugs including Bristol-Myers Squibb's (NYSE:BMY) Opdivo and Roche's Tecentriq. Through collaborations with Bristol-Myers and Roche, Exelixis recently announced plans to run phase 3 trials based on promising phase 2 data for the combinations. Most investors are focused on Cabometyx -- for good reason -- but Exelixis does benefit financially from other drugs as well. A partnership with Genentech, which was purchased by Roche, led to the development of Cotellic, which was approved to treat skin cancer in 2015. Roche and Exelixis share profits and losses on the sales of Cotellic, which is expected to turn a profit this year. But the bigger opportunity for Cotellic will likely come from combination therapies with other drugs. In the last year or so, Roche has started three new phase 3 trials testing Cotellic in different settings. Interestingly, Bristol-Myers Squibb has also tested Cotellic with Opdivo, supporting the idea that combinations are likely to spur future growth in sales of Cotellic. Exelixis also has a late-stage drug out-licensed to Daiichi Sankyo. It goes by the codename CS-3150 and started a phase 3 trial in patients with high blood pressure last year. Daiichi Sankyo is responsible for development, so at this point, Exelixis just needs to sit back and see if it can collect more milestone payments and double-digit royalties on sales if the drug is eventually approved. Buyout -- certainly not the best investment thesis, but a real possibility given large pharma's desire to buy growth. Call it potential upside that really shouldn't be factored into the valuation. Rebuilding pipeline -- management has expressed interest in restarting Exelixis' drug discovery after shutting it down to save cash. It's a longer-term scenario, but at least it should offer some potential future growth if a buyout doesn't happen. Acquisition -- a second approved drug could help Exelixis leverage its sales force. The company doesn't have a whole lot of free cash to make a large purchase, but it might be possible to do a transaction for stock if the right deal presented itself. It's hard to call Exelixis cheap, but with multiple ways at its disposal to increase its value, investors should consider taking at least a small piece of this biotech with potential for better things to come.